It’s vital to keep these plants far away as possible from children and pets. When pruning or repotting these plants, keep your hands away from your eyes and mouth, wear gloves and wash your hands thoroughly afterward. The dangers range from mild skin irritations to severe reactions that require immediate medical attention. Here’s a list of the common names of common plants, arranged by which part of them is poisonous. Which ones are in your home or garden? Do a bit of research on each and consider if the risk they pose to children, pets or yourself (as you handle them) is worth keeping them. 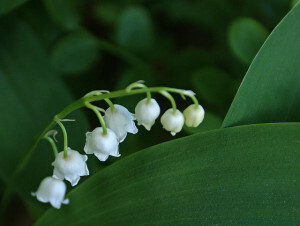 Featured image credit: “Lily of the Valley” by Randi Hausken, https://www.flickr.com/photos/randihausken/2505596762/. License by https://creativecommons.org/licenses/by-sa/2.0/.